My last 5am wake-up was today, although we didn’t see many birds in this time. After our breakfast at 6:30, we got ready to leave. As our van arrived to take us to the airport, a trio of scarlet macaws flew by to bid us farewell. We loaded up the van and promptly fell asleep as we got underway. We stopped at a gift shop along the way, where I got rid of all my Belizean currency by spending it on hot sauce. We drove for a little longer and went to a restaurant for lunch, where we were given a large spending cap that some of us (Alessi) utilized to the fullest by ordering tons of food. We drove for another hour and then had reached the airport. Going through security and customs in Belize was a breeze, and the fact that Sarah G. and Ellie got randomly selected meant they boarded the plane first and saved us a few rows of seats. We spent the plane ride doing crossword puzzles and chatting. Thankfully, I didn’t see any members of my taxon group today, or else there would have been snakes on the plane. I awoke this morning with the sinking realization that today would be our last full day in Belize. Today would be a day full of hiking, as we set out all of our time to retrieve our camera traps that we had scattered far and wide a few days ago. Today, though, we got through the first half of our hike much faster than we did last time, retrieving all of our traps from the bush with relative ease. On this hike, we saw a Golfo Dulce Anole (Norops polylepis) among the leaf litter, easily distinguished by the diamond pattern on its back. We then returned a little early for lunch, so we knocked out our lectures before eating. 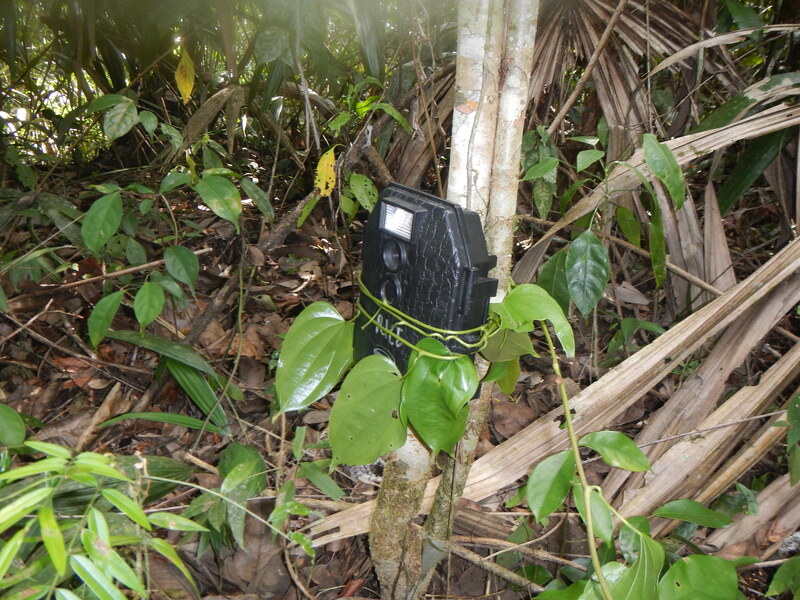 After a nice lunch and relaxation time, we went back out to collect the rest of our traps from the Monkey Tail Trail. These were a bit harder to find in the denser vegetation, and it took us a total of five and a half hours to cover about six kilometers because some of the camera traps were harder to find than others. I didn’t manage to see any more reptiles on this leg of our retrieval. Our trap results were eventful. 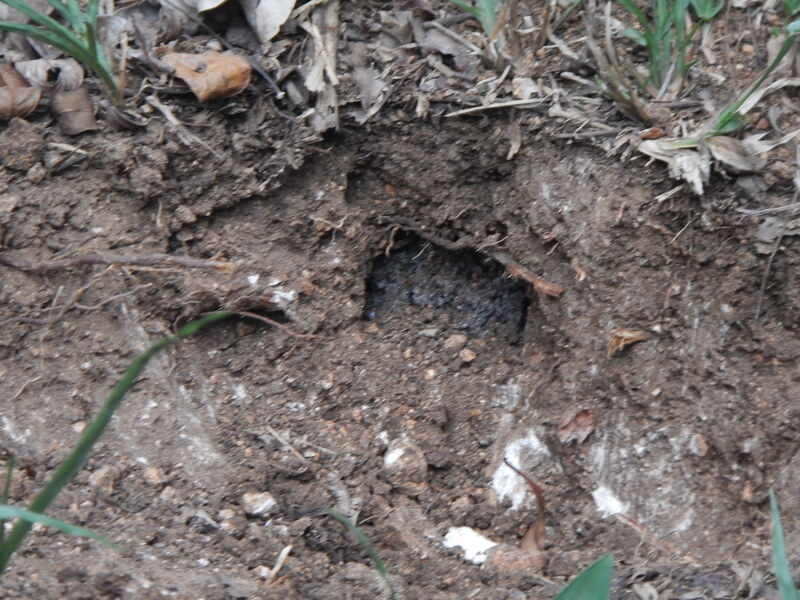 Most of the traps came up empty-handed, but a few of them showed us a large bird, some mammals, and even two ocelots! What a great way to top off an amazing trip. It won’t be easy to leave tomorrow. To start the day, I did some birding, where we managed to see a strange, turkey-like bird called the Crested Guan. After breakfast we went back to the rainforest to collect our traps, which we spent the morning evaluating our data from the last 24 hours and writing it up as a poster. After a nice lunch, we were determined to see as many different places in our vicinity as we could. 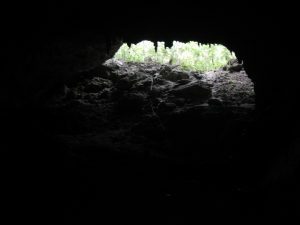 To start, we went into the cave close to the research station, which was another former Mayan ritual site. In the cave we saw one Helmeted Iguana (Corytophanes cristatus), and one Neotropical Rat Snake (Senticolis triaspis). We didn’t go to far into the cave, but we went in for long enough for me and Ellie to give presentations on our taxon groups in what would have been pitch-black without our headlamps. 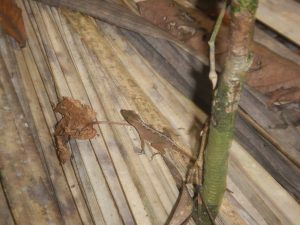 When we came back from the cave, we spotted a Litter Gecko (Lepidoblepharis xanthostigma). After caving we hiked up to the Bird Tower, a short but difficult hike that left us with a spectacular view to see the Chiquibul forest from all angles. Therese gave us a presentation of her research up there, and by the time we descended it was dark out. We took this chance to have a night hike back to the research station, right on time for a late dinner to top off the day. I started my day a little later today at 5:30 am (late is relative) for birdwatching, only to be greeted by two massive bug bites on my left ring finger, which have yet to go down. We didn’t see much until it was almost time for breakfast, when we saw two Scarlet Macaws nearby, which made for a nice treat. We ate at 6:30, and then got ready for our first experiment of the day. Our goal was to see if arthropod diversity and nutrient availability differed from the forest floor. This involved setting pitfall traps that included our own urine, which should be interesting when we go back for the vials tomorrow. 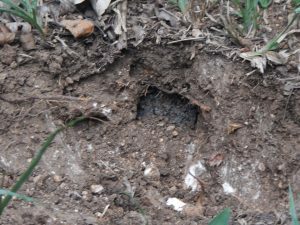 After that, we go to relax a bit before lunch and our second activity, where we went to leafcutter ant colonies of various sizes to dig in around the nests and see what they looked like inside. We were able to see the increase in complexity as the age of the colonies increased, as they got much bigger and had more pathways as they increased in age. Some paths in the nest were even wide enough that I could fit my whole arm in them. 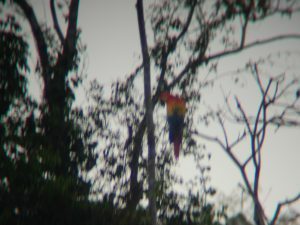 After returning and waiting for dinner, we saw even more macaws flying by. Unfortunately I didn’t manage to see any reptiles today. This was a disappointment, but I was beyond thrilled to have gotten the chance to see the macaws, which are incredibly beautiful and very rare. Now, I can only hope that my bites go away soon and that my finger can return to normal size. 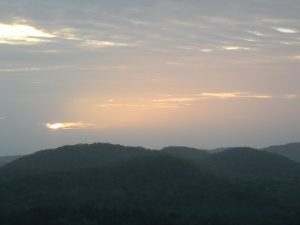 We started our day early today for birdwatching, but the hazy morning made it difficult to spot much of anything. After a late breakfast at 7:30, we designed our first project of setting out camera traps to monitor predator and prey, hoping to spot a big cat or two when we collect the traps again in a few days. We may have bitten off more than we can chew though; we set about half of our traps before lunch, and then went back out at 2:30 to set the rest of them. This involved going deep into the bush, though, and we did a little bit of accidental meandering that led us to return to the field station a full five hours after leaving and a bit after dark. This made for an interesting, dark, spider-filled walk back to the station. This means that we spent the high majority of today walking, something I haven’t done in a while. We managed to see a lot of reptiles today. This morning we spotted a Norops biporcatus, a green tree anole, and a Degenhardt’s Scorpion Eater snake, also known as Stenorrhina degenhardtii. In the afternoon we spotted a Plestiodon sumichrasti, a Sumichrast’s skink, a Norops lemurinus, or canopy anole, and even a small Bothrops asper, the notorious Terciopelo snake. Upon returning to the station, another group had found a Turnip-Tailed Gecko, also known as Thecadactyla rapicauda. Our last consecutive day of travel finally led us to Las Cuevas, but not before some fun first. 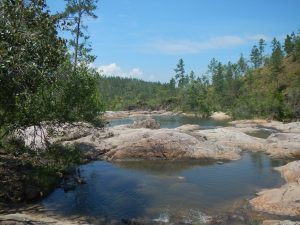 After departing from our nice lodgings and all internet access, we stopped at a nice river and waterfall area for a dip in the water. 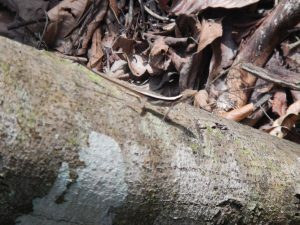 On the way there, we spotted a brown basilisk (Basiliscus vitiattus) from the van. The scenery was beautiful and the water was nice, and none of us wanted to leave. I spotted some kind of ameiva lizard there, but I didn’t have my ID card so I couldn’t pinpoint the species. We also enjoyed eating a soursop together, which was many peoples’ first time having one. This is one of the many perks of having islanders on this trip. After swimming, we got back on the bumpy road to Las Cuevas, playing card games to pass the time in the van. We arrived at Las Cuevas around 1:15pm and were greeted by a delicious lunch. 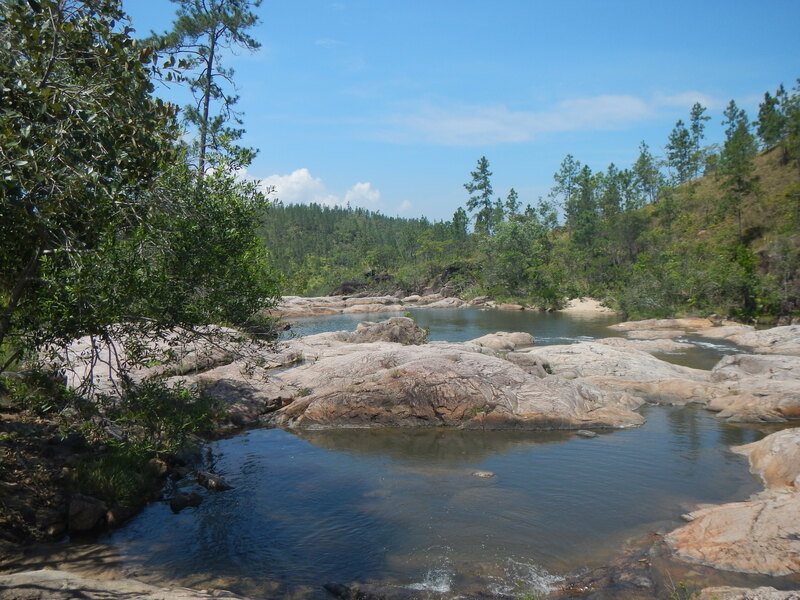 After settling in, we got a brief orientation and went for our first hike in the Chiquibul forest. We spent two hours walking through the forest, seeing lots of spider webs and even the vegetation-covered stones laid by Mayans over one thousand years ago. 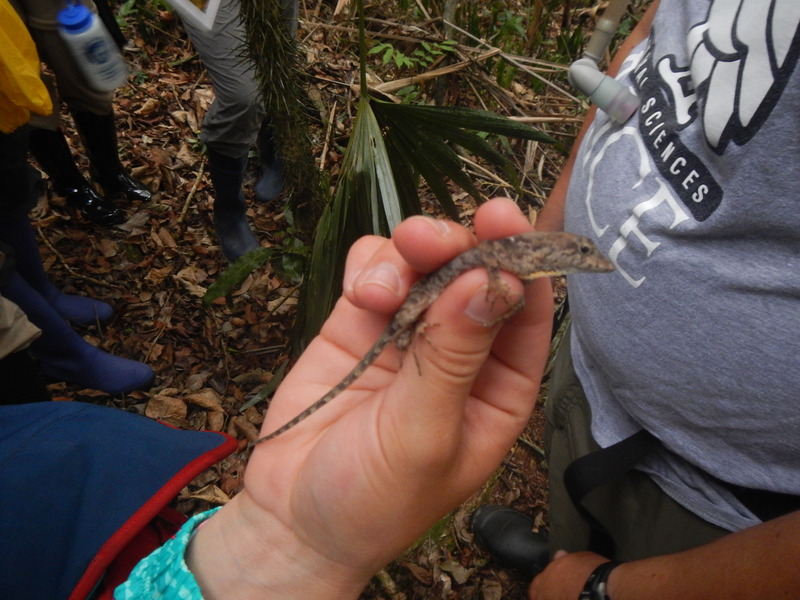 We spotted a Crested Anole (Anolis cristatellus) in the forest, but that was it for reptiles. We returned at 5:40, and spent time unwinding at the station. Since the rains have just started, we witnessed a termite nuptial flight, which some of us took as a chance to eat termites. 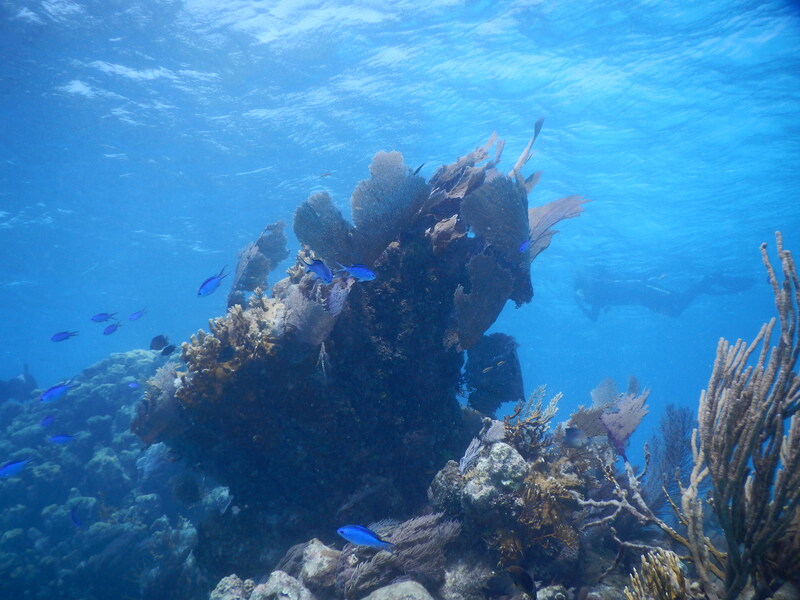 Today was another day of activities that involved us wearing dive booties out of the ocean. After departing TEC and our lovely cabanas in the morning (and saying goodbye to Adrienne with heavy hearts), we drove for an hour and change to the Actun Tunichil Muknai cave, also known as the ATM cave. The cave was partially filled with water, so we swam to get in and then waded for much of the walk in the cave. The water was refreshing after standing in the hot sun to get there, and the inside of the cave was lined with lots of beautiful stalactite formations. The cave also had ceramic artifacts and even human remains inside from the Mayan age. After we finished in the cave, it was raining outside. Since we were already soaking wet from the cave, we came back to the parking lot just as wet. The rivers we crossed to get to the cave that previously felt cold now felt like hot tubs. 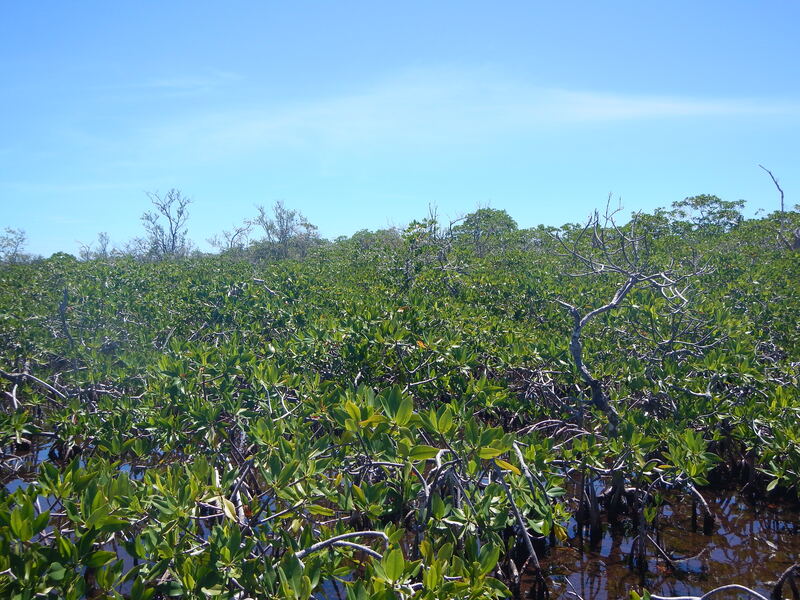 We had a nice lunch upon returning, and then set our course to San Ignacio. While at the ATM Cave area, I spotted some kind of skink or mabuya that I wasn’t able to identify, as well as some other lizard that I couldn’t recognize. In San Ignacio, we walked around a bit and stocked up on supplies before going to the rainforest. I bought some plantain chips, a soursop, and Damien and I opportunistically bought bandanas to hopefully keep the bugs off our faces. We are now staying at Crystal Paradise Eco-Lodge, getting our last taste of wifi for the next week and enjoying some cool post-rain weather. Tomorrow, we go into the jungle. This morning, as part of our last day on Glover’s, a few of us woke up early to watch the sun rise from the watch tower. This time, no clouds obscured the view and the sunrise was perfect. We left soon after, though, and had departed by 8am. 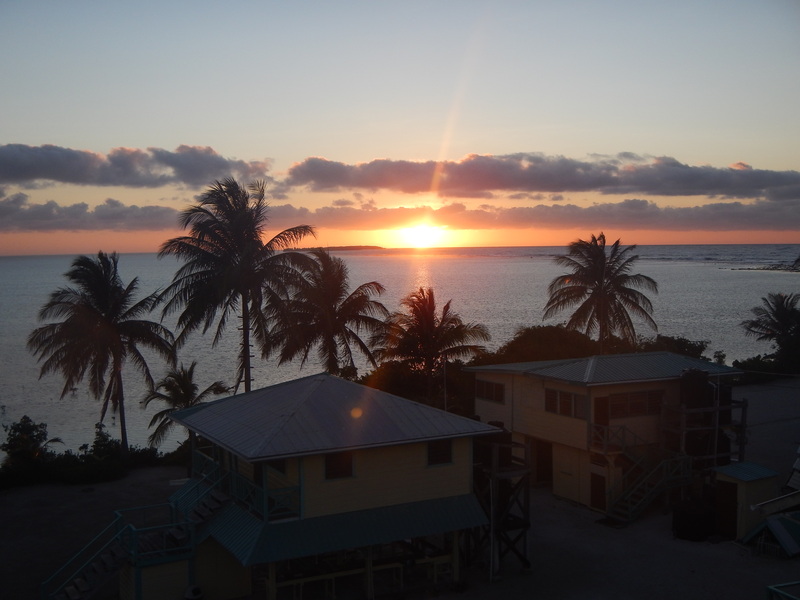 At this point, we set our course for Carrie Bow Cay, an island in the atoll that is owned by Smithsonian and used for research. It was a very small island that could only host a few people, but it was quite nice. 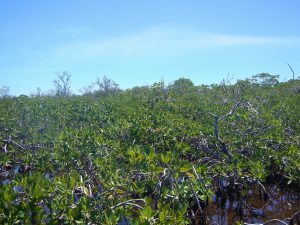 After touring there, we went to the nearby Twin Cays, where we waded into a mangrove forest and snorkeled in the sea near the mangroves. 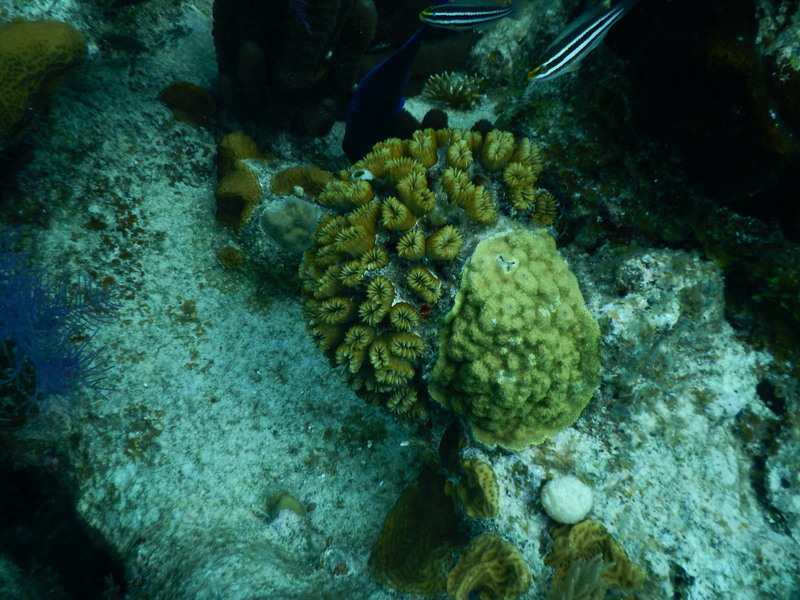 We saw a manatee from the boat, and in the water we spotted tons of sea stars and even a seahorse. We got back to land at about 1pm, at which time I can say that, for the first time, I have fallen asleep on a moving boat. We ate a big lunch at Calypso before driving back to the Tropical Education Center, where we will again be staying for the night. We walked some of the trails here, where I got mosquito bites on my face, ate dinner, and then went to the nearby Belize Zoo for a nighttime visit. We got to see lots of big cats like a puma, an ocelot, and an especially friendly jaguar named Junior that loved rolling around on the ground. We also saw a few reptiles; we saw a Boa Constrictor, a fer-de-lance (Bothrops asper), one American Crocodile (Crocodylus acutus), and one Morelet’s Crocodile (Crocodylus moreletii). Once again, I can’t wait for my ice cold shower later, especially because the water pressure will be reasonable here.